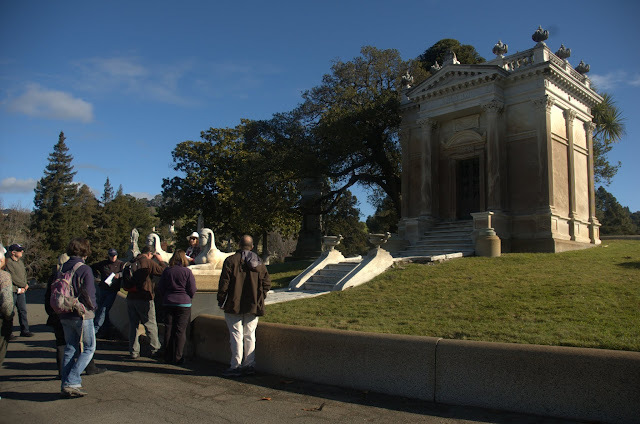 Saturday we had perfect weather for a walking tour at Mountain View Cemetery. Second Saturdays there are general tours to give people an overview, and fourth Saturdays there are more specialized tours focused on different subjects. This one was titled "Perimeter", which promised a fair amount of walking because of the size of Mountain View. The tour was led by docents Stafford Buckley and Barbara Gibson. Also on hand was docent Michael Colbruno, author of the extremely interesting and useful Lives of the Dead website about the people of Mountain View Cemetery. We started in the chapel in the main mausoleum with a brief overview of the cemetery, its founding and its design. It was founded in 1863 by a group of Oakland civic leaders who met at the house of Dr. Samuel Merritt. It was designed by Frederick Law Olmsted, the noted landscape designer who also designed Central Park in New York. We headed for the nearest point on the perimeter, with a few interesting stops along the way to note some different mausoleums and graves, including the stately Colton mausoleum. It's the resting place of David Colton, who is sometimes referred to as one of "the Big Four and a half" because of his involvement with "the Big Four" (Crocker, Huntington, Hopkins and Stanford) of California and railroad history. 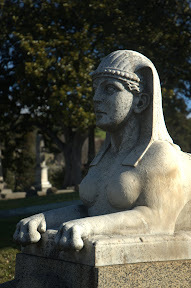 The mausoleum is guarded by a pair of Greek-style sphinxes. Along the southern perimeter there are several reservoirs, which were created by damming Cemetery Creek (which is known as Glen Echo Greek further downstream). They normally provide water for watering the cemetery grounds for 1 to 2 months of the dry season. Nearby is one of the unendowed sections of Mountain View. Normally people purchase a plot or mausoleum crypt in Mountain View, which pays for its uptake in perpetuity. People were buried in the unendowed areas with no such promise, but as long as family or friends wanted, they could maintain the grave site. Areas of the unendowed section were also given to a number of charities, like the King's Daughters' Home, a hospital for people considered incurable. That building was designed by Julia Morgan, and still stands at 3900 Broadway. We also heard about Blair's Park, an amusement park on the border between Oakland and Piedmont. It was created by Walter Blair, who owned property in the area, and featured boat rides, ponies, music and other amusements. Blair also owned the horsecar which brought vistors up the hill from Oakland. We headed up the hill to see the eastern perimeter, which provided spectacular views of Oakland and the bay. Stafford said that on a clear day from the top of Hill 550 it's possible to see nine Bay Area counties. From the back of the hill you can see areas where many eucalyptus trees were cut down to decrease fire danger, and many, many more redwood seedlings have been planted in their stead. We walked back downhill along the border shared with St. Mary's Cemetery, and past the influenza plot back to our starting point. As always, lots of interesting stuff to see and learn in Mountain View Cemetery! After the tour was over, I rode my bike around to check out a few things for the Oakland Wiki and do some scouting for another history focused bike ride that's in the planning stages. And also to get a closer look at the grave of Fred Korematsu.